Premier XtraBond®9500 Sealants have become the advanced polymer leader for residential, commercial and industrial usage. This multipurpose line features rapid curing and permanent exibility. Each is engineered to deliver aggressive adhesion with the most common construction substrates, while ensuring complete compatibility. These unique features make XtraBond®9500 Sealants the ideal choice for professionals everywhere. The XtraBond®9500 line has been expanded to include new varieties. Choose from textured, clear or custom color nishes. Or, opt for a self-leveling sealant for horizontal joints. Industrial and transportation applications may call for our extreme high strength adhesive. 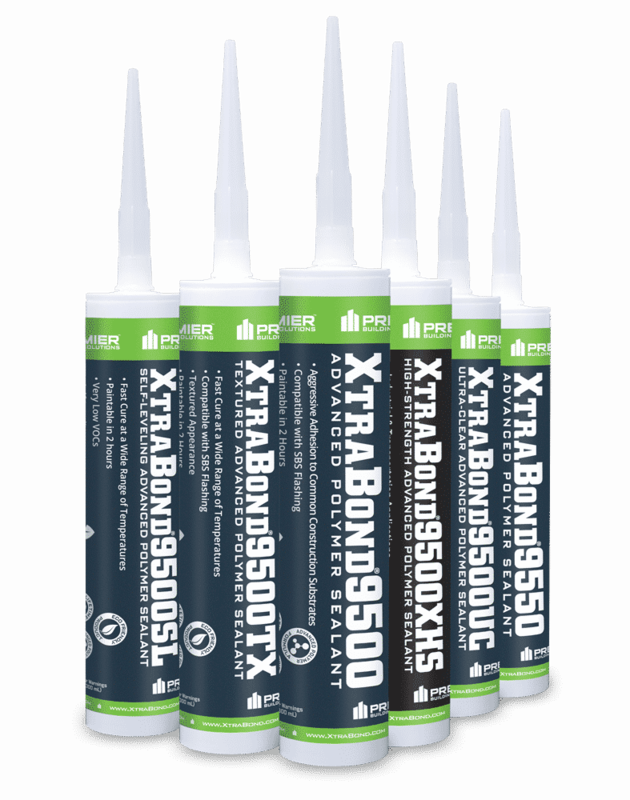 Consider our next generation XB9550 for 50% joint movability with added adhesion and exibility. And the flagship XtraBond®9500 is available in hundreds of colors, scientifically formulated and matched to some of the most popular window and door manufacturers around.